There are two commonly suggested or recommended methods of laying porcelain paving, but each has its pros and cons, not least of which is the skill level required to achieve a high standard of finish. While there are umpteen different terms used to describe each method, we’ll go with ‘Full Wet Bed’ and ‘Thin Bed Adhesive’. A third method relies on using pedestals but, just for now, this is a technique that is much less popular in Britain and Ireland than it is in mainland Europe, and so it is not covered any further on this page. Advocated by several major suppliers, this method relies on carefully placing the tiles onto a leveled-out bed of standard sand/cement mortar, prepared to a wet consistency (slump of 50mm or more – Slump Class S2 or higher). The mortar bed needs to be a 6:1 or a stronger mix of grit sand with ordinary portland cement (OPC) – see Contractors’ Mix – minimum of 20mm thick, and should be placed over a prepared sub-base or base. Most contractors are using 25-40mm thickness to ensure a bed with sufficient depth to create a rigid layer capable of supporting both itself and the porcelain paving units, although some are using considerably thicker beds, as much as 100mm depth in some cases. The inclusion of a sub-base (or base) is essential. For the Wet Bed method, a 100mm deep sub-base of Type 1 material (or similar) is typical, although in exceptional circumstances a rigid base, usually mass concrete, will be used. Omitting the sub-base (or base) and placing the mortar bed directly onto a sub-grade is highly likely to result in the whole pavement failing in the short-medium term. As with the Thin Bed Adhesive method described below, a Bond Bridge primer applied to the underside of the tiles is essential. Using joint spacers (either proprietary paving joint spacers, plastic spacers as used in the window fitting trade, or even pieces of 6mm plywood) will help maintain a regular joint width between the units and also minimise the risk of accidentally spalling any vulnerable edges. The tricky bit to this method lies in consolidating the tiles down to the correct falls and levels. This requires the receiving bed to be fairly accurate, but sufficiently proud to accept the tiles and allow them to be tapped down. Accordingly, judging the ideal level of the receiving bed and then getting the right degree of rippling in its surface to accommodate the tile is not as simple as some guides would have you believe. And then there is the ‘tapping down’. Admittedly, the tiles are tough, probably much stronger than one might expect, but they cannot be hammered. They will withstand a reasonable clonking, but too much force, too heavy a blow will probably cause a breakage. However, there has to be enough of a tapping down to ensure that a sufficient proportion of the tile base is in direct contact with the supporting bed, so an overly gentle tap or two probably isn’t enough to get the 70% contact we would regard as the minimum requirement. Too little clonking will leave the tile resting on ridges of mortar with voids between, and so the bed will not provide a full support. Trial and error is the only way to learn just how much surcharge, how much rippling, and how much clonking is needed to get the tile down to the perfect level, with the correct falls. Obviously, as more and more tiles are laid, the bed preparation will become second nature, but for the first few tiles, it’s really important to take time to judge the bed and the amount of settling that is possible. This is what makes the Wet Bed method tricky for those unfamiliar with porcelain paving and the use of mortars. 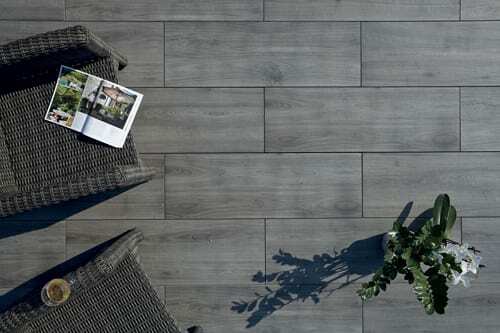 This method is favoured by those with many years’ experience using porcelain paving in Europe and would be our preferred method of installation. It is being promoted by some suppliers as a better option for the occasional installer and/or DIYer. While the fixing of the tiles might be considered easier using this method, the necessary preparatory work is more exacting than that for Wet Bed installation. In this method, the tiles are laid in the same manner that would be used for flooring tiles inside the house. They are affixed to a pre-installed base using a specialist tile adhesive, which should be an outdoor grade polymer-modified cement-based goo. The adhesive is spread over the rigid base using a notched spreader to give a bed of uniform depth, and the tile is then pressed down onto the adhesive and settled down to falls and levels. As with the Wet Bed method described above, a Bond Bridge primer should be applied to the underside of the tiles prior to placement unless the adhesive manufacturer specifically states that no such primer is required when used with porcelain paving tiles. It may be necessary to check with the adhesive manufacturer’s technical department because the guidance given on/with the packaging may not have been updated since porcelain paving became popular. The thickness of the bed is usually specified by the adhesive manufacturer. Some will be as little as 3mm, but most will be 6-10mm. The bed thickness is critical to establishing the finished level of the base onto which the tiles will be laid. To ensure a high standard of finish, the tiles need to be laid to falls and levels over a bed of uniform (or fairly uniform) depth. It’s not good practice and will make the job that much more difficult, if the bed is, say 4mm deep at one end and 10mm deep at the other. So, the key to getting an even, uniform bed is to have an even, uniform base on which to lay it. In nearly all cases this will be a rigid concrete base which can be placed immediately prior to laying the tiles or can be done hours, days, or even weeks in advance. The concrete base need not be reinforced: a simple 75-100mm thick slab of mass concrete, C7.5 or stronger, can be poured and retained by formwork to ensure the finished levels, once the plastic concrete is tamped and floated off, are within a millimetre or two of the levels needed to accommodate the bed and tiles.